The aptly named Waterproof OverBoard 5 Litre Dry Flat Bag is made of super-light ripstop-TPU coated nylon that folds away into a flat little package when not in use. It’ll even fit in your pocket! However wet or dirty your surroundings, the ingenious Fold Seal System™ and welded seams on this small Dry Sack ensure your valuables will stay dry as a bone and dirt-free. 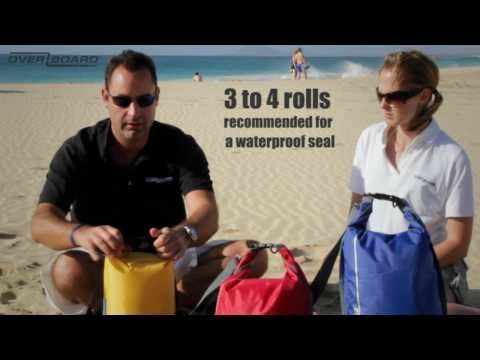 Made of tough materials, it’s easy to wipe clean and if you do get clumsy and drop it overboard, this Yellow Dry Bag is suitable for quick submersion and will float neatly to the surface. Small enough to hang on to wherever you go and with a handy removable shoulder strap, our neat little 5 litre Dry Flat Bag is a waterman’s best friend. "Just a quick note to thank you for the excellent service. Haven't water tested them yet but fit perfectly. I will have no issues in fully recommending your company. Thanks." "Dear Customer Services - Your communications are fantastic, your delivery is fast and well packaged and your website is easy to use! The sun is shining and I thought that you ought to know that I am one happy customer!!"